Motor vehicle drivers pass bicyclists safely countless times every day. When done improperly, however, the results can be tragic. Some drivers say that they are unsure of what to do when they encounter bicyclists on the road ahead. It’s therefore important to increase public awareness of how to pass a bicyclist safely. 2. Look and Wait until Safe. 3. Change Lanes to Pass. Your first responsibility as a driver is to not hit other people who are already in front of you. This means always being prepared to match their speed or stop as required. Slowing down ensures that you’ll have the time you need to fully assess the road and traffic conditions prior to executing a safe pass. Lower speed also gives you more time to react should conditions change, and greatly reduces the danger you pose to the bicyclist should a collision occur. If you’re traveling too fast to slow down in time, that means you’re violating the basic speed law. You must always limit your speed so that you can stop within the distance that you can see ahead. This principle is known as assured clear distance ahead. Always choose a safe speed for conditions, and keep your eyes on the road. Don’t pass bicyclists at high speed; high speed is associated with most sideswipe collisions involving motorists passing bicyclists. 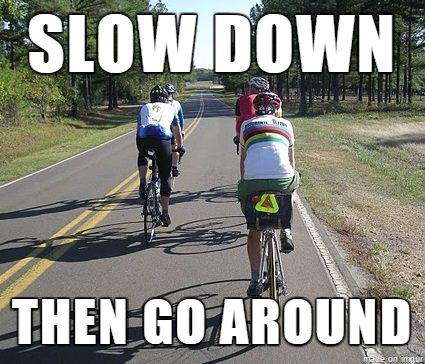 Slower speed gives everyone on the road more time to see, think and respond to one another. 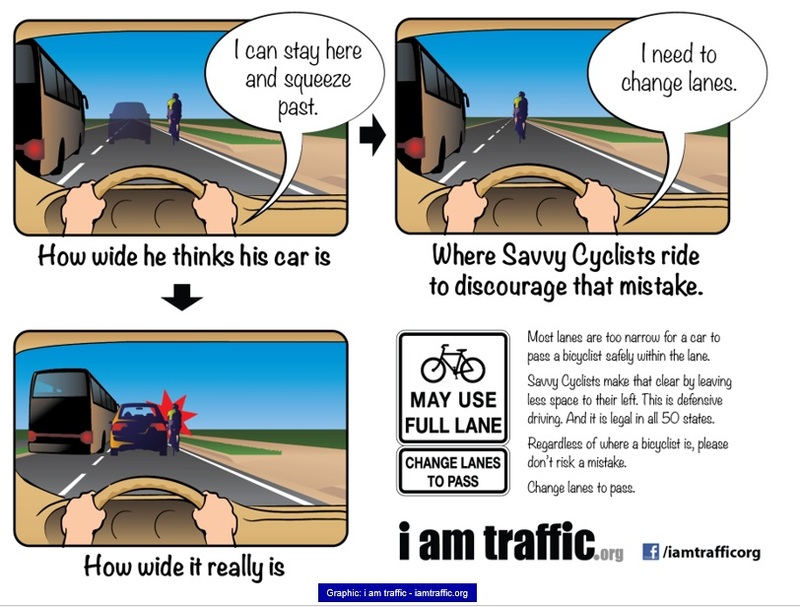 Don’t try to squeeze between a bicyclist and other traffic in the adjacent lane. On the vast majority of roads, travel lanes aren’t wide enough for this to be safe. Attempting to squeeze past a bicyclist in the same lane is the most common cause of car-overtaking-bicycle collisions. You’ll need space in the next lane in order to pass, so look for a safe gap in that traffic and wait as required. If the adjacent lane is for opposite-direction traffic, wait until you have sufficient sight distance to ensure that no traffic will arrive before you can complete the pass. 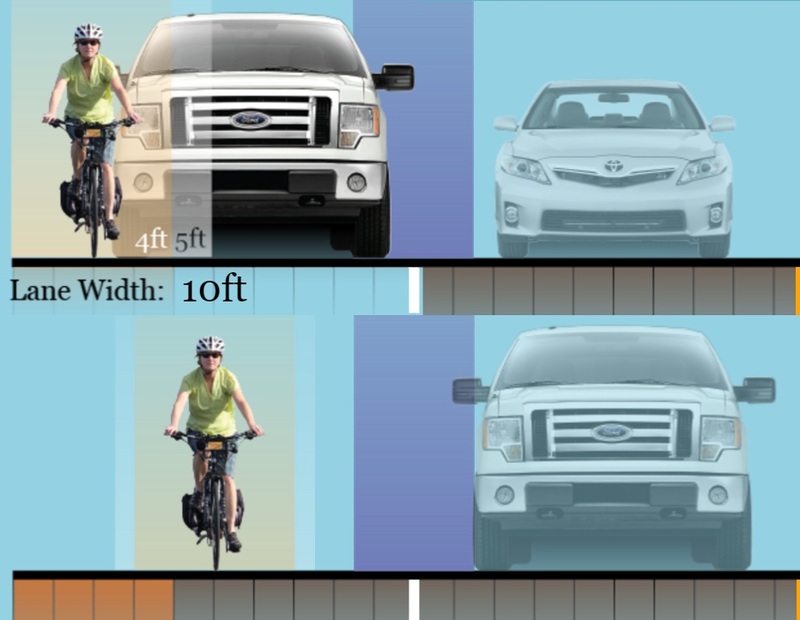 Some bicyclists will hug the right edge of a narrow travel lane in an effort to stay as far away from other traffic as they can manage. Don’t misinterpret this as an invitation to pass within the same narrow lane; these bicyclists report lots of unsafe same-lane passing of the type that most often results in collisions. Knowledgeable bicyclists will often ride near the center of a narrow lane, or ride two abreast, in order to deter motorists from making the mistake of trying to squeeze by. These cyclists aren’t being rude; they are just driving defensively. Make sure you can see an adequate distance ahead to ensure oncoming traffic won’t arrive before you finish your pass. State law requires waiting until you have adequate clear sight distance before you pass. The longer the group, the greater distance you’ll need. § 20-150. Limitations on privilege of overtaking and passing. (a) The driver of a vehicle shall not drive to the left side of the center of a highway, in overtaking and passing another vehicle proceeding in the same direction, unless such left side is clearly visible and is free of oncoming traffic for a sufficient distance ahead to permit such overtaking and passing to be made in safety. (b) The driver of a vehicle shall not overtake and pass another vehicle proceeding in the same direction upon the crest of a grade or upon a curve in the highway where the driver’s view along the highway is obstructed within a distance of 500 feet. …. Lastly, don’t pass at an intersection where traffic may enter or cross the passing lane, and don’t attempt to pass a bicyclist immediately before turning right. You may underestimate the bicyclist’s speed and cut the bicyclist off or hit them during your turn. Instead, slow down and merge to the right behind the bicyclist as you approach the turn. It’s better to follow for a few extra seconds than to risk a collision. Once you have an adequate gap in traffic in the next lane, move completely into that lane. This will give the bicyclist a safe buffer and the room they need to maneuver for maintaining balance and avoiding surface hazards. You may ask: “What if there is a solid line indicating a no passing zone?” Passing a bicyclist in a no-passing zone is legal in North Carolina when done safely with no oncoming traffic and adequate sight distance, passing at a distance of at least four feet or moving completely into the next lane. See § 20-150. Limitations on privilege of overtaking and passing. You may ask: “What if I start to pass and I realize that I’ve misjudged oncoming traffic?” Simple: Press your brake pedal, and slip back behind the bicyclist(s). No harm, no foul. Worst case: Stop completely, and let everybody sort it out. Stopped vehicles don’t hurt people. These three steps don’t take much time and effort. In many cases there is no net delay to the motorist; in the worst cases, the delay is rarely longer than that of waiting for a traffic signal. If you experience delays that are longer in North Carolina, we’d like to know about it, so we can better understand the effects of road design and bicycle traffic on your convenience, and consequently support desirable road improvements and/or have an informed discussion about where and when bicyclists may be able to help you pass sooner. Send email to contact@bikewalknc.org to send us the North Carolina road location, time and date of where you first encountered a long delay, and where on the road the delay ended, and we’ll share your information with NCDOT as well. Cyclists would have more room on the shoulders if states would refrain from putting wake up ridges outside the white line boundary on U.S. State, & County highways. These ridges are primarily put there for truckers, but truckers rarely hit U.S. & State highways for the long hauls, they primarily use Interstate highways for long hauls. Just finished riding from Miami to Iowa and we dealt with this issue the entire way. We were forced to ride in the traffic lane and are lucky to be alive. Safe touring in the U.S. is nearly impossible due to these ridges. I understand their importance but there needs to be consistency. The people operating these machines that create those rumble strips must be drunk. The ridges are there for all drivers. Let’s find other solutions but ridges are needed now more than ever as a result of texting. That’s thinking backwards, J potts! The problem is people texting at the wheel! Ridges on the road encourage carelessness, just like all so-called safety features that aim to increase the safety of the driver & passengers above all other road users. True, but there is also a positive aspect to rumble-stips. A lot of cyclists don’t use mirrors and when someone crosses onto the shoulder over a rumble-strip, you get a very good (audible) indication that you are in danger. No matter how wide a shoulder is, once wheels have crossed the rumble-strip, more space is of little value. I can’t tell you how many times a TEXTER and/or DUI has drifted onto the shoulder and the sound gave me an opportunity to get out of their way before impact. A bike operating on the shoulder is not legally using the roadway (look up definition of roadway vs road). Should the bike move into the lane of travel (the roadway) from the shoulder – or should it be construed he did so from the statement of a witness who wasn’t really paying attention at the time – the bike rider is, or could be held as, responsible for any accident. I shake my head when I see a bike riding on a narrow piece of pavement to the right of the white line. Not trying to encourage any debate here, just food for thought from a retired accident investigator. Cyclists in western wake county often ride in packs that don’t follow basic road rules like stop signs. It is dangerous for everyone since drivers expect everyone on the road to follow the same rules of the road. I’m all for cycling, let’s make it safe for everyone. You’ve got a point. I have seen this in groups, have been in groups that do that, and probably have done this myself. It was always wrong, and I don’t do it anymore. I realized that as a cyclist, it takes a special kind of ignorance to be the smallest guy out there, and break the rules, and yet expect everybody else to follow the rules, where the smallest guy’s safety is concerned. Having said that, after 25 years of bicycling, I can also say that many, many cars have a disproportionate sense of their superiority on the road. Might does not make right, and automobile operators need to understand that bicyclists have a right to the road too. I see motorists failing to follow “basic road rules” every day, in ways way more dangerous than what cyclists supposedly do: Speeding. Texting. Drinking and hoping for the best. Failing to let people on foot cross at the WALK before turning. Not yielding or stopping for people walking at the crosswalks as the law requires. Rolling past stop signs ignoring that people on foot are trying to cross. Right on red without actually stopping and ignoring that people on foot are in the crosswalks. Honking at cyclists who are in the proper lane. Throwing objects at cyclists who are in designated bike lanes. I’m all for driving, let’s make it safe for everyone. I ride in groups as part of a cycling team. We sometimes ride in western Wake County on charity rides. I can’t speak for everyone, but we ALWAYS stop at stop signs. 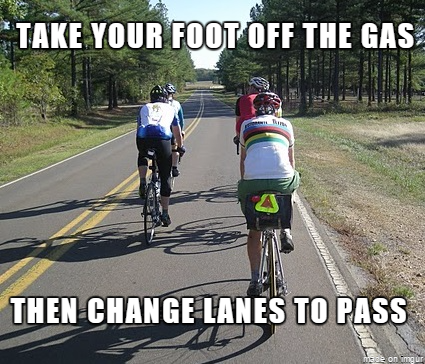 Our ride leaders always emphasize even before we pull out for a ride that we have to drive like cars. Just wondering how many motorist brake the law by going over the speed limit, or rolling through stop signs, I do. I drive/ride and I know that I am not perfect on either machine, however I practice safe defensive driving techniques to avoid accidents. Lets not play the blame game lets both share the road. Why do cyclist ride on the sidewalk, because they are scared of driving on the road, why do we take up more of the road, because of drivers passing too close. The three steps to pass a cyclist is the same as passing anyone using the public roads. Why is this so hard to understand? The town that I visit almost daily, Lake Forest, Illinois, requires all cyclists to ride on the most dangerous area possible, the sidewalk. Guess the city fathers don’t realize that bicycles are vehicles too. What I don’t understand is bicyclist that cycle on back country streets that barely have lanes for two cars, have dangerous curves that are very hard to see around, and have no shoulder for cyclists. Where I live there are plenty of parks and other areas dedicated to those on bikes, and a very well thought out set of lanes downtown for them to ride on. So why on Earth would they insist on cycling in a place that is barely safe for the cars going don it? Bicyclists use those roads for the same reason motorists do: To go somewhere. Just as people who travel by car don’t limit themselves to freeways, people who travel by bicycle don’t limit themselves to parks and paths. If public roads are deemed inadequate for the traffic that uses them, then the prudent response is to improve the roads, not marginalize members of the public who use them. North Carolina’s countryside is beautiful, which attracts people using all types of vehicles, whether they choose to live there or are just passing through as tourists.